People who talk in their sleep are usually unaware of their problem until it is pointed out to them by their partner, room-mate or parents who are often disturbed by the talking. Sleep talking is an unconscious habit that can stem from unresolved issues from the past and it is often necessary to regress your client in order for them to allow the memories to surface and be dealt with. 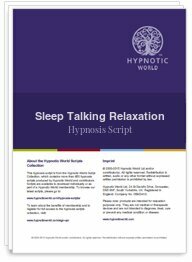 This Sleep Talking hypnosis script from Hypnotic World can help your clients to discover whatever problem their sleep talking is trying to alert them to so that they and their partner can enjoy a restful night's sleep.